Fifteen players from Henley Hawks Under 9s travelled to Montpellier, France last Friday (23rd March) for an unforgettable weekend of rugby. Montpellier, currently leading France’s Top 14 league, arranged for the players, coaches and parents to stay in their academy accommodation and shortly after arriving they were treated to a behind the scenes tour of the stadium with detailed insight into how Montpellier players prepare and train and what happens on match days. From gyms to chill-out rooms, the tunnel, hospitality areas and players’ changing rooms the Henley players were given an inspiring glimpse into what goes into making a successful Top 14 club in France. They met current coaches and players, including New Zealand World Cup winner, Aaron Cruden. Saturday saw the Hawks play in two series of matches. In the morning they trained with the Montpellier Under 9s and then played mixed matches with their hosts. The Mediterranean sunshine had given way to freezing rain but spirits were not dampened. After lunch the teams met up with local club Juvignac. Before playing matches the clubs got together in some friendly games including a tug of war. Although the players were defeated the Hawks coaches were pleased to notch up a win in this event at least. In the spirit of international rugby both teams then lined up to sing their national anthems before playing a series of matches. The Hawks, who only started contact rugby at the beginning of the season, got a sense of how French rugby differs from English. In France players learn to tackle, ruck and maul from the age of six and this experience showed in the early skirmishes. The Hawks managed to adapt in the latter stages however and put in some fine handling and running displays but were beaten in their games. 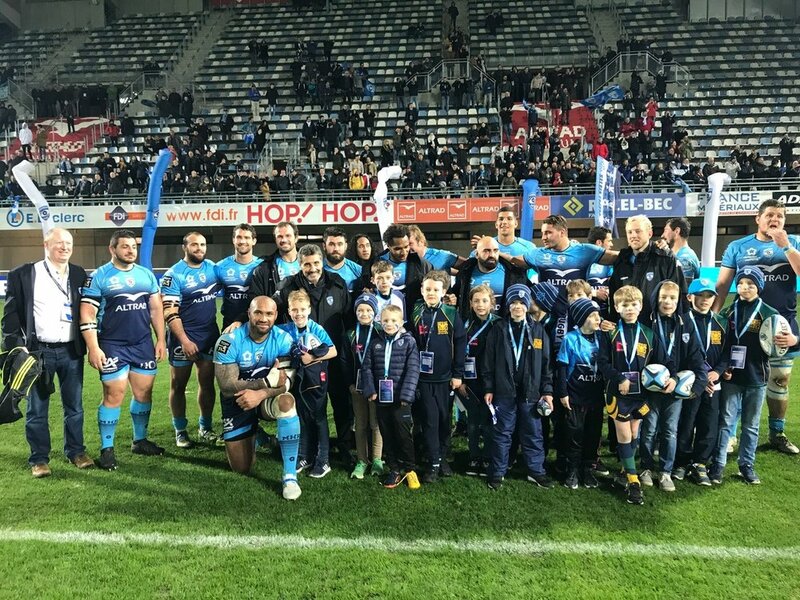 On the Saturday evening, the Hawks presented Montpellier with a framed club shirt, which was accepted by Montpellier and South Africa star, Jan Serfontein, before they formed a guard of honour at the Altrad Stadium for Montpellier’s home match against Castres. After watching the home side brush aside the visitors in a 45-7 victory the players, coaches and parents were taken onto the pitch for photos with the victorious team. They also met club Chairman Mohed Altrad who, along with Hawks father Mark Clifford, had made the whole trip possible. On the Sunday, before heading back from the Mediterranean to the UK, the tour group were taken to the coast to play some beach rugby and reflect on an incredible weekend.